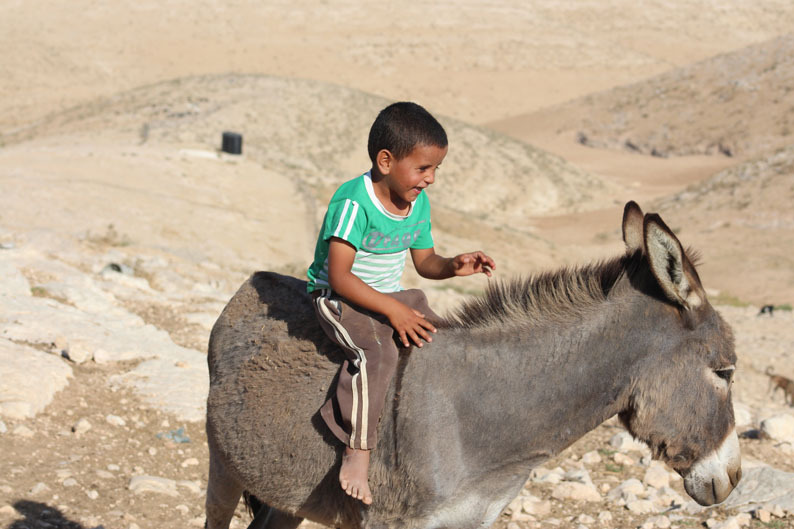 Um al Kher, a community of 127 people (21) families located in the south eastern part of the Hebron Hills. It is for the most part surrounded by Israeli settlements, the closest being Karmel directly across the fence from Um al Kher. What passes for a road and in reality a rocky path between other rocks leads to the community from a modern paved road that has been constructed in support of the settlements and outposts. The community itself is a collection of tent structures, animal shelters and assorted other shelters sitting on gravel and rock with various indigenous plants like cactus providing some necessary colour. On our first visit we are very warmly and enthusiastically met by Eid Suleiman, a resident of Upper Um al Kher and a swarm of excited youngsters. We are escorted to the community centre, a tent with a smooth cement floor, a permanent metal piping for framing, sides and ends open offering a panoramic view of the surrounding area and a welcome breeze on this very hot afternoon. While enjoying the customary hot tea we discuss the recent events and activities in the community. The children come and go wanting their photographs taken and balloons that we offer to be inflated for them. It is at this point we witness a small taste of the reality of what the residents endure day in and day out. Screaming can be heard from across the fence separating the community centre in Karmel in apparent response to photographs being taken of the foliage (cactus) along the fence. Almost immediately a fully armed Israeli soldier appears and commences to patrol a path along the fence on the Karmel side until after our departure later on in the afternoon. Karmel is a modern settlement, legal in Israeli laws but declared totally illegal internationally. It possess paved roads, street lights, lawns, gardens and numerous facilities. Its residents receive approximately an allotment of 200 times per resident for water annually than do the residents of Um al Kher. Um al Kher is often without water for up to 12 days at a time. A road leads along the fence along the community and separating the grazing areas for the sheep from Karmel. This road, which is on property owned by the community is no longer allowed to be used to herd their sheep to the pastures. Tent structures frames can be seen on the slope of the pasture which we are advised were erected by the settlers (residents of Karmel) in an initial attempt to lay claim to the pasture. We are also shown the community bread oven (taboon oven) which is essential to every communities survival as a mainstay support to their dietary needs. In the past the Karmel residents have attempt to destroy this oven as well as go through legal processes to have it demolished. 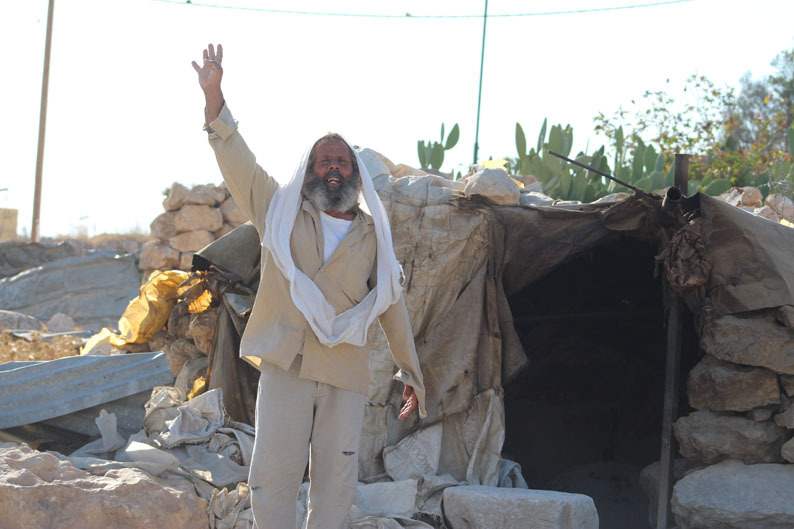 In the community itself, between upper and lower Um al Kher all but 2 structures including residents are under demolition orders and under immediate threat of demolition. The settlers frequently harass and throw stones at the residents of Um a Kher. 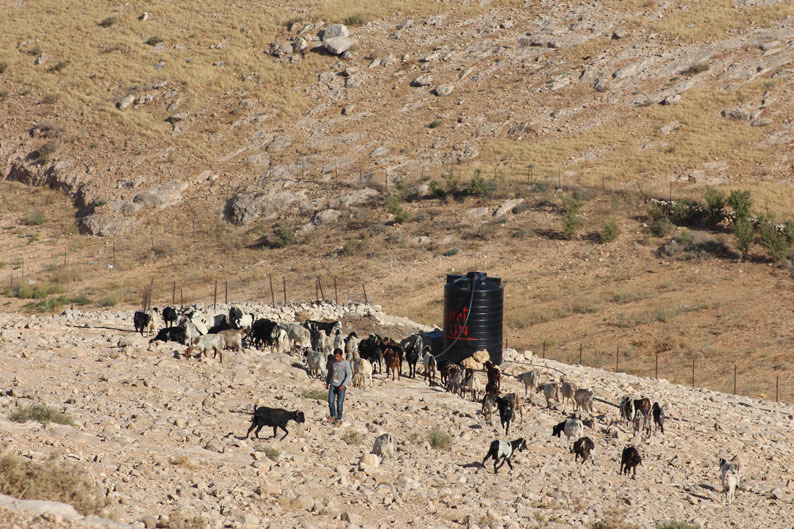 They scare away the sheep and prevent the shepherds from accessing their grazing lands. The Israeli army also plays their role in ongoing harassment of the residents of Um al Kher through a variety of methods not the least are frequent night raids and flying check points. Having met the many of the residents of this delightful community I cannot for the life of me understand to what end or purpose these tactics of the Army employ serve other than pure harassment. One would think with a small glimpse into what the residents of this community endures that they would be quite frustrated or bitter over their situation. Of course they are not content and are using every means at their disposal to challenge all the obstacles put in their way. They do however have a very positive outlook on life, enjoying their lives as best they can under the circumstances with a very strong resolve to endure on their own. They choose to be great hosts to the many delegations that come their way and to present an amazingly charming outlook refusing in many cases outside help. 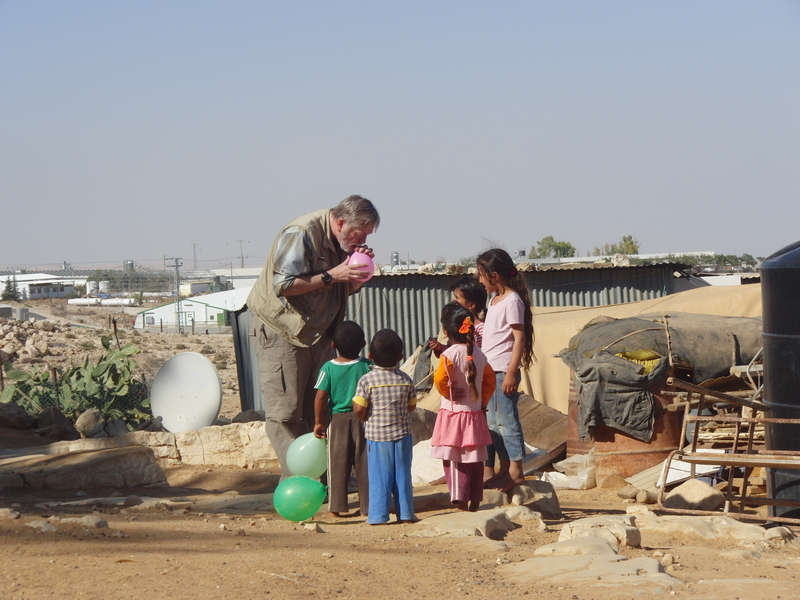 All they want is to be able to continue to live their simple lives as have their ancestors not only here where they live now but where they previously lived in the Negev Desert where they were moved from in 1948. 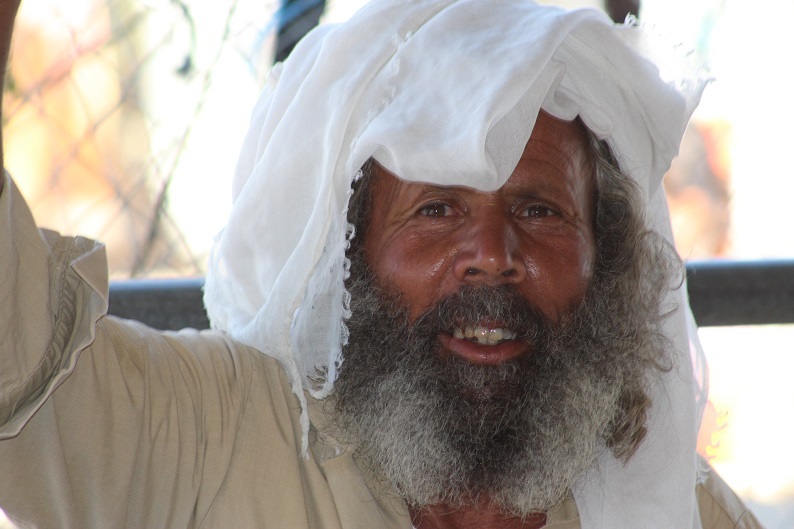 Thank you for the photos, Ron, a wonderful time of tea with these Bedouin families is a treat. And the taboun bread…I remember it well. Greetings to Eid Suleiman and family and all of the families of Uhm el Kher. Is Abed your translator and guide? Ron, I and others here in Whitehorse will follow with interest your postings on this blog. 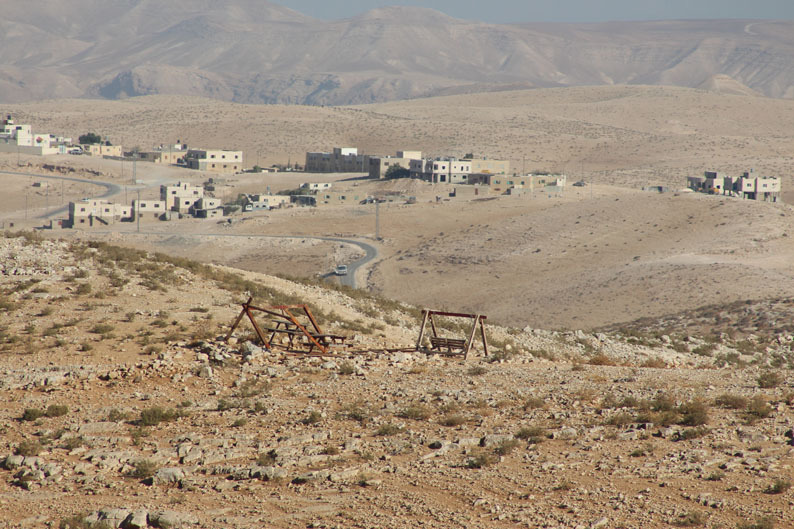 I hope you can tell us more about what legal processes the residents of Uhm el Kehr are using to hold onto the land. you continue your great writing, have a nice day! Thanks for the generous comments. I just I hope that this effort can make a small difference for the people in Palestine. Thanks again so much, it is genuinely appreciated.